A prisoner escapes from Lincolnshire's only open prison almost every week. During the last 12 months 49 people walked out of North Sea Camp prison in Freiston near Boston - the second highest number in the past nine years. 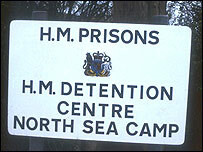 Figures released to the BBC under the Freedom of Information Act show 339 prisoners have absconded from the camp since 1996. The Home Office has defended the system, claiming the number of escapes is at its lowest level for 10 years. But this is only in relation to an increased prison population. Juliet Lyon, the director of the Prison Reform Trust, said: "Any people who leave any sort of prison early is a matter of concern. "Open prisons are a bit like an airlock for people who have been locked away for years, who need time and opportunity to adjust before they are released. "If that process is cut short, that is a matter of concern."